The cover background is a facsimile of a page from a fifteenth-century Zohar, the primary work of the Kabbalah. The large stylized letter Aleph, the first letter of the Hebrew alphabet, also signifies the number ‘I’ and is symbolic of the one Lord, origin of all, creator of all. The flames within the letter signify the primal spiritual light. The menorah (seven-branched candelabra) represents the qualities of the divine light and the seven stages or levels of creation. It is the oldest symbol associated with Judaism. The Search for Spiritual Inspiration and understanding is universal. Although there have been periods in history when the idea of the divine has become externalized, grounded in the material and the secular, there have always been those people whose direct experience of the mystical reality proved otherwise. Most recently in Europe, the eighteenth, nineteenth, and early twentieth centuries saw a rejection of the mystical in favor of social, material, intellectual, and scientific progress. In Judaism this tendency gained great strength under the name of the Enlightenment, the Haskalah, which promised release from the insularity of the Jewish community vis-a-vis the dominant Christian society. Yet at the same time, the explosion of Hasidism as an expression of the belief in the mystical and the essential importance of the spiritual master, the tsadik, in attaining soul liberation, counterbalanced this materialistic tendency. Indeed, personal direct experience of the divine through the intervention or inspiration of a spiritual master has always been accepted by devotional groups within Judaism. Perhaps because of the waves of persecutions the Jews had experienced in European society over the centuries, Jews had developed a tendency to look inwards for their sustenance and strength. In this milieu, many great spiritual leaders appeared, mystics and moralists who gave form to their spiritual practices and developed complex systems of meditation and mystical symbolism. 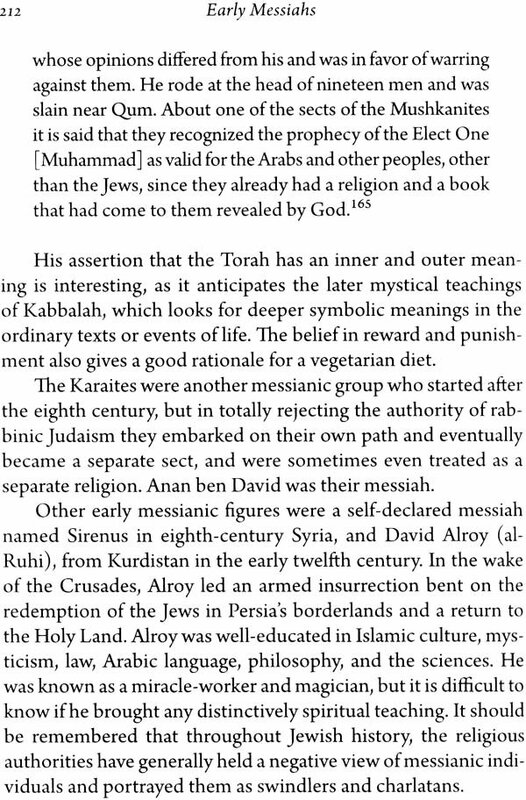 By the mid-twentieth century, the intellectual Jew was careful not to abandon himself to emotional or ecstatic types of worship, nor to acknowledge the beauty and inspiration offered by the complex symbolism of the kabbalists. ‘The modern intellectual regarded the mystical as mysterious, confusing, and somehow untrustworthy. For the mainstream religious Jew of western society, God became an abstraction rather than a living being. As a transcendent abstraction he could not answer prayers. For the intellectual, there was no room for a living spiritual master, a teacher who could put his disciples in touch with the divine holy spirit, the ruah ha-kodesh of the Bible. Anyone could have access to the abstract divine being - intermediaries not needed and not welcome - or at least this was the maxim taught to the masses and the youth. In recent years, Judaism has moved on towards a more mystical approach. No longer is there shame associated with devotional ecstasy. Attitudes often reflect a cyclical spiral, and so today there is a “renewal” movement in Judaism that has brought many people in touch with the mystical nature of their being. These are people seeking a more immediate experience of God, who invest their religion with renewed hope for spiritual transformation. They are not afraid to seek masters, leaders, rebbes, tsadiks, holy men and women, under whose wings they can grow towards a first-hand experience of God. 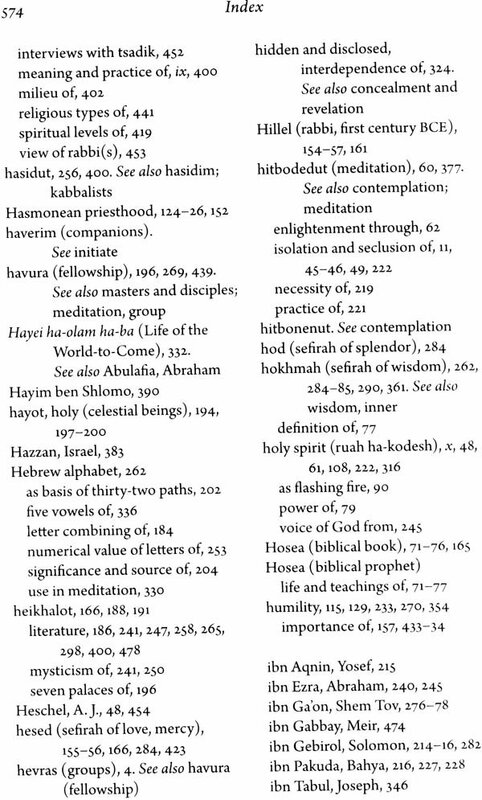 The purpose of this book is to rediscover the spiritual masters of Jewish history whose teachings have brought inspiration and spiritual solace to generations of Jews - from the prophets of the biblical period through the mystics and rabbis of antiquity; to the hasidim (pietists) of Germany, the Sufis, and kabbalists of the Middle Ages; to the messiah figures of all periods, later kabbalists and wonder workers, and finally to the tsadikim of Eastern European Hasidism. The spiritual level attained by these individuals will always remain a mystery for us, both because of limitations of our own experience and the impossibility of assessing another person’s spiritual experience. The depth and degree of their influence on their disciples also would have varied according to the receptivity of those disciples. The dominant threads, however, we can discern: the yearning for spiritual understanding, for closeness to God, relief from the sufferings of the material world - all these the living spiritual masters shared. The richness of the literature they left behind is a witness to the great creative surge that the inner spiritual quest inspires. It is my own experience with a living spiritual master that has inspired me to dive into these three millennia of Jewish life to bring to the surface the evidence of those great teachers and mystics who dedicated their lives, physically and spiritually, to continually renew the heart and soul of Judaism. They have been a channel for the divine power to enter the physical realm of human life, and a ladder through which others might ascend and experience the divine. Working on this book has given me the opportunity to focus on the mystic heart of my own inheritance. It has been inspiring to discover the continuum of voices within Judaism that resonate with the voices of the great spiritual leaders and masters of other ways and paths to God. It is this discovery that has been thrilling and humbling for me, with my deep roots in Judaism, as I have researched material for this book. In essence, this book is concerned with the universality of spiritual truth as expressed through the Jewish experience. 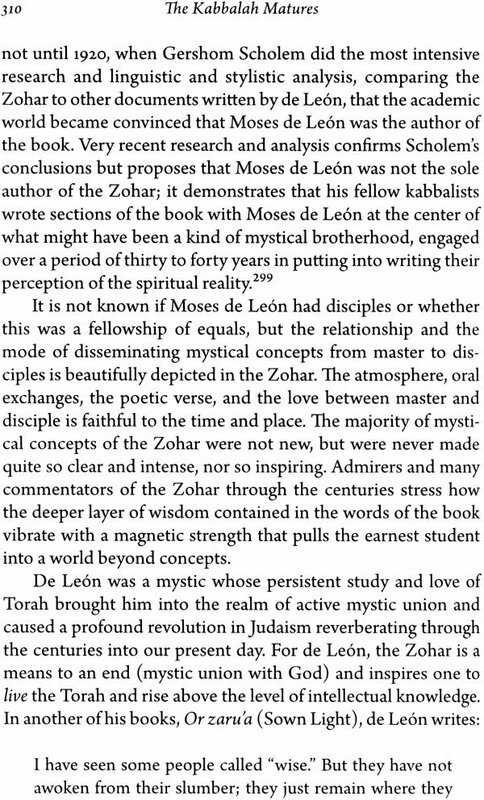 In its natural unfolding as a mostly chronological study, The Mystic Heart of Judaism attempts to demonstrate the primacy of the spiritual master as the teacher and transmitter of truth. It presents the living teachers and their living teachings, their inner spiritual life with the divine, their relationship of love with their disciples. It is my hope that this book will be of value particularly to other readers with a Jewish heritage who are searching within their tradition for knowledge of the one God who is common to all humanity. And if their search takes them to a living spiritual master who can inspire and guide them on the path of mystic awakening, they will be most fortunate. The twenty-first century is witnessing a growing dialogue among adherents of the world’s religions as they explore their common foundation of spirituality while respecting the differences arising from history and culture. It is hoped that this book will make a positive contribution to that dialogue by bringing to light the perspectives of Judaism’s great spiritual teachers and mystics. I wish to thank all those who have so generously helped me complete this work by sharing their insights, reflections, and encouragement. Through this project, I have gained the invaluable friendship of such illustrious scholars as Joseph Dan, Rachel Elior, Immanuel Etkes, Eitan Fishbane, Michael Gottsegen, Menahem Kalus, and Jacob Neusner. I have been greatly enriched by having had personal contact and correspondence with them, and I look forward to a continued dialogue with this fountain of knowledge and light. I also wish to acknowledge with fondness the contribution of the late Steve Segal, who assisted me with the initial research on the kabbalists discussed in this book. The Hebrew Word Olam, meaning “world,” is thought to derive from the same root as the word “to conceal” (le-ha’alim). Mystics are those who, while living in the dam, see through its illusion of substance to the eternal, divine reality it conceals. Like pearl divers who plunge to the depths of the ocean, they retrieve the pearl of pure spirituality and share their wisdom with humanity. Throughout the millennia of Jewish history, every generation has given birth to mystics who have sought the great spiritual treasure that is concealed within the revealed. Mystical practice is like a fine thread that runs through the entire history of the Jewish people. From the earliest biblical accounts of the patriarchs conversing with God, to the prophets’ passionate commitment to their divine mission, to the merkavah mystic’s inner journeys to supernal realms, to the kabbalists’ creation of complex meditation practices, Judaism has always been enriched by these courageous souls, fired by longing for the divine, who let no obstacle stop them in their quest. Through its 4,000-year history; Jewish mysticism has taken many different forms. At times it has been highly devotional and ecstatic; at other times it has been extremely intellectual. At times it was the solace of small groups of kabbalists who kept awake night after night in study and meditation; later it became the manifested joy of the hasidim who made it available to the entire Jewish community. Additionally, because the Jewish people have lived as a minority among adherents of different religions and cultural traditions, the Jewish mystical experience reflects its exposure to these distinct influences. In Western Europe, Jews came in contact with Christian concepts of God, including its feminine aspect, the Virgin Mary, contributing to the development of the concept of the Shekhinah - the feminine, immanent aspect of God. Austere Christian monastic traditions also influenced Jewish mystics and practitioners in the Middle Ages. 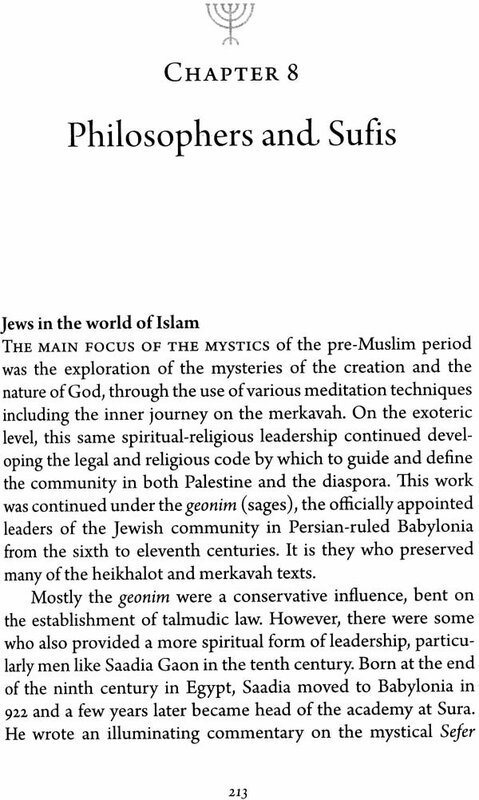 And when Jews came in contact with Muslims settled in Palestine, North Africa, and Spain, they absorbed elements of Neoplatonism and Sufi mystical practice, to the point where some Jewish writings are nearly indistinguishable from those written by Muslim mystics. 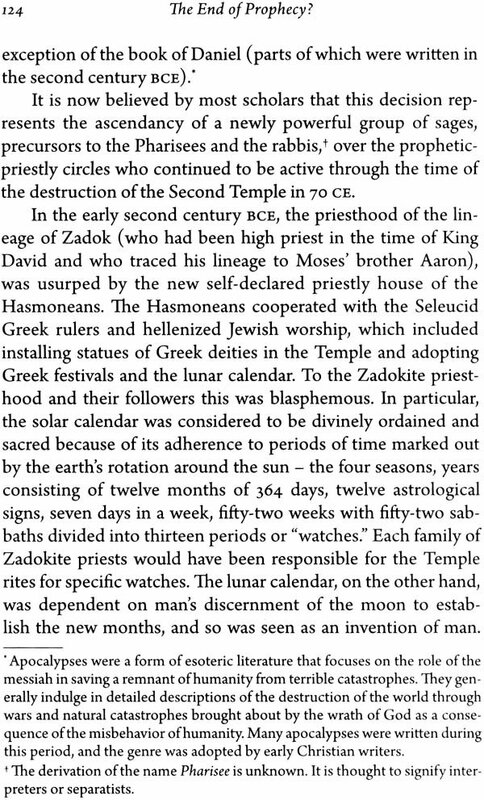 Jewish mystics also traveled widely around the Mediterranean and influenced one another, creating a dynamic spiritual tradition. Yet throughout this highly diverse and many-faceted history; certain themes and characteristics keep recurring. ‘This book tells the story of Jewish mysticism in chronological order, each chapter focusing on a particular time and place, a particular group of mystics, a particular movement in the ever-evolving story of Jewish mysticism. Roughly, the themes that keep reappearing, in spite of vast cultural and historic differences, can be grouped as follows: the chain of transmission, divine unity, divine language, inner journey and mystic experience, and the theme that suffuses all aspects of Jewish mysticism - Revelation and Concealment. 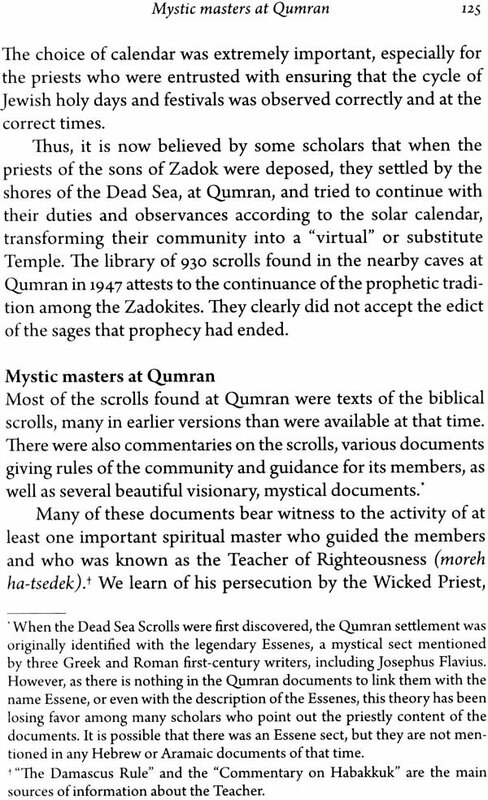 From the time of antiquity, before there were written records that attest to an historical lineage of mystics, we encounter many legends and traditions about the biblical patriarchs which portray them as spiritual masters - evolved beings in contact with the divine who imparted their sacred knowledge to humanity. For example, several legends about Adam symbolically tell the story of God bestowing upon him the spiritual teaching in the form of a book, or as a gemstone, which he later passed down through the generations. 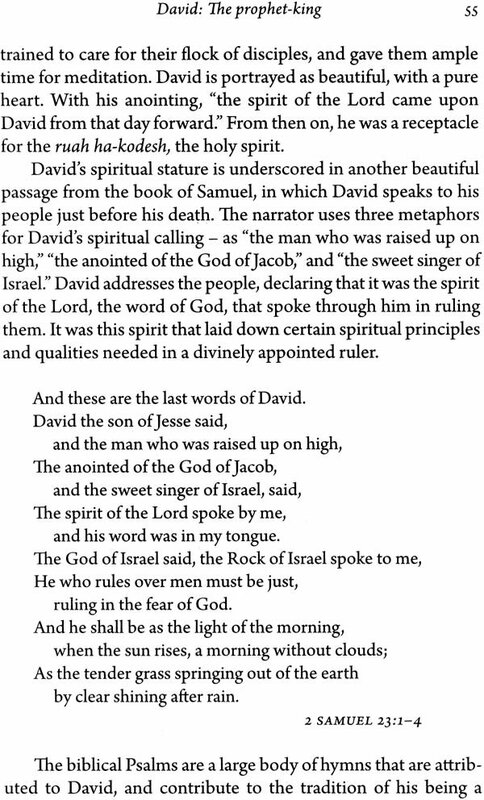 Eventually, as the legends explain, this knowledge, this light, was shared with humanity through the prophetic mission of Moses and his spiritual heirs - the Israelite prophets. After the period of the Bible, we have more distinct evidence that mystics continued in their quest to have the experience of God. The merkavah (chariot) mystics, active from the first to eighth centuries, would assemble discreetly in small groups to undertake their spiritual journey and lend support to one another. They were called chariot mystics because their mystical experiences were portrayed as a journey in a chariot. Their teachings were brought to Europe by ancient travelers around the Mediterranean basin. They spread from Palestine and Babylonia to Italy, from there to Germany, and later to France, Spain, and throughout Europe. In many of these documents there are references to heavenly revelations and contact with the prophet Elijah and other supernatural beings. Yet there was always an emphasis on the transmission of the teachings from master to disciple. Beginning in medieval times, the kabbalists passed on their teachings in secrecy, and later more openly. The relationship of these mystic masters with their disciples was very intimate. They would assemble in small groups called hevras, or idras, their entire lives being devoted to adhering to their masters’ instructions with great sincerity and intensity. It is with Hasidism, the movement that began in eighteenth- century Poland, that the teachings were spread to the general populace, the householders - no longer remaining the province of an elite group of mystics. 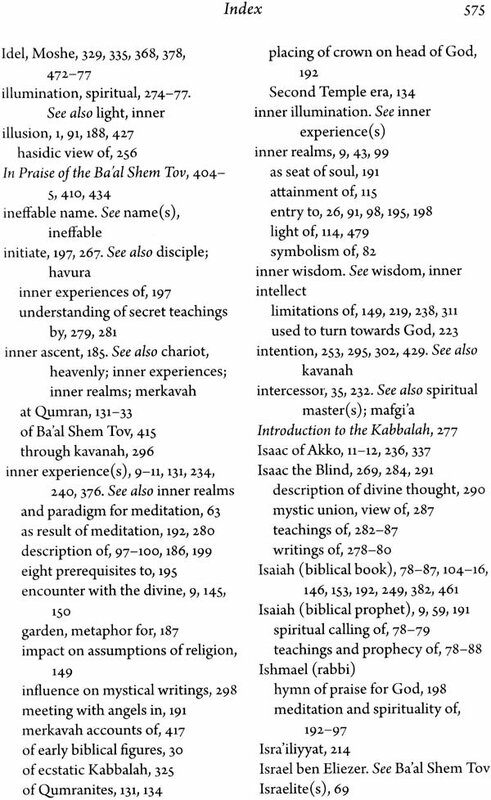 And in Hasidism we find the most explicit emphasis on the importance of the spiritual master, the tsadik. He is described as descending from his high rung on the ladder of spirituality to the low level of ordinary people, and raising them to his level where they might experience the divine bliss and joy. Sometimes the master himself was considered the ladder, whose lowest rung was on earth and whose highest was in heaven - he could straddle both the worlds. His conscious- ness was in the physical as well as the spiritual realms, and thus his true spiritual nature was concealed by his physical body. 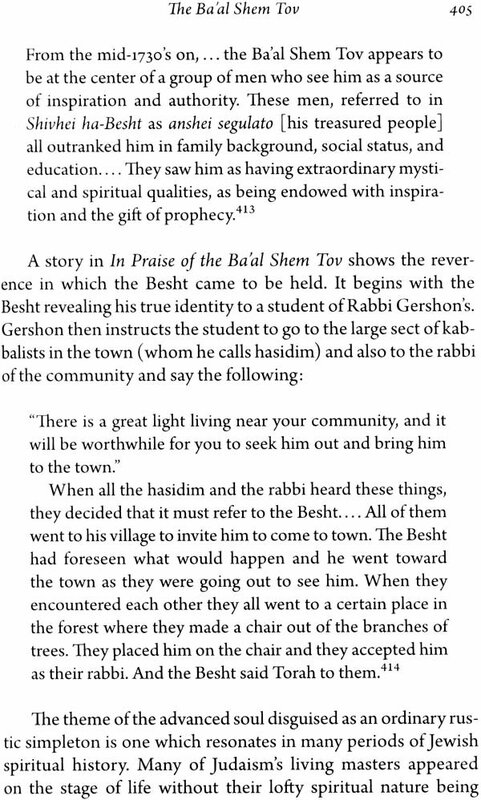 One of the Habad hasidim said that the tsadik was “infinite substance garbed in flesh and blood.’ By attaching oneself to such a master, individuals could ascend to the heights of divine experience. The theme of concealment and revelation may also be found in the belief that there are true spiritual masters present among humanity, but they are disguised as ordinary persons. The example of the prophet Moses is often brought forth: Moses is depicted as an ordinary, somewhat clumsy person with a stutter, yet God chose him for the divine mission of saving his people. 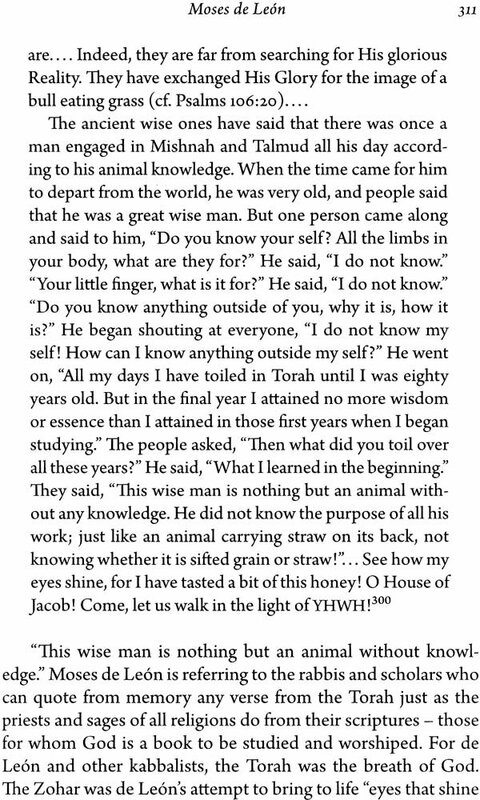 In the medieval Zohar, the most important text of the Kabbalah, there are poignant tales of a mule driver who is wiser than the renowned rabbis, and of a child who is the hidden spiritual master. 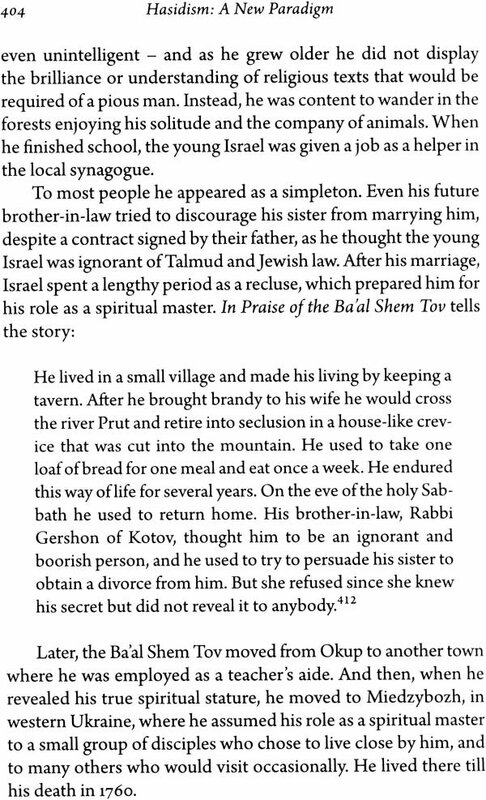 Numerous stories have also been recorded about the hidden spirituality of the first hasidic master, the Ba’al Shem Tov, who concealed himself as an uneducated ignoramus and, ultimately, through his actions and pronouncements, revealed that he was the great master and liberator of souls. So the true seeker needs to be watchful and thoughtful, as one never knows where or when he will find his master. Perhaps these stories are also a metaphor for the deep truth that all of us, who seem to be quite ordinary, are created in the image of God - that we, as we are, contain the potential for the greatest heights of spiritual achievement. Our soul is a spark, a particle of the divine essence, trapped in the physical world only temporarily, as we await liberation through the teachers he sends. An important characteristic of Jewish mysticism is that, despite the expression of the religion through a multiplicity of outer forms and rituals, there is a sense that a single spiritual reality abides in and underlies everything. To the mystics, the one God, who is the object of prayer and the focus of religious practice, can be realized through meditation as the singular creative power that gives life to the entire creation. Without it, creation would disintegrate. Everything is in You and You are in everything You fill everything and you encompass it all; When everything was created, You were in everything; Before everything was created, You were everything. The multiplicity of the material creation leads us to think that there truly is a diverse reality, but mystics know through personal experience that there is only one divine reality or substance flowing through all of creation. It is the only true reality, as the coarse outer covering of the material creation will perish in time, and only the divine truth or essence will remain. In contemporary terms one could call this a “nondual” approach to religion as it sees the one, rather than the many, in everything. Kabbalist mystics in medieval times introduced the terms ayin (nothing) and yesh (substance) for these two opposites, ayin signifying the formless divine essence that pervades everything, and yesh the physical creation. The tension between the two poles also became the defining motif of Habad Hasidism in the nineteenth century, which emphasized the importance of looking beyond the revealed realm of yesh to come in touch with ayin - the concealed infinite. From approximately the twelfth century, Jewish mystics developed a complex symbolism describing the spiritual realms and the process of creation. The literature describing this symbolism makes up the bulk of the texts of the Kabbalah. At its core was the need to explain how yesh - matter - could have been created by a God who is ayin - entirely abstract and without substance. The kabbalists taught that a series of divine qualities (midot) were emanated from the supreme God. These qualities were also called emanations (sefirot), and were generally visualized as flowing in a hierarchical order, each sefirah (emanation) a projection or reflection of the one above but existing at a lower vibratory level. ‘Thus the light, the power, of the unitary Godhead, also called the Ayn-Sof (the infinite eternal, from the word ayin), which is beyond differentiation, flows downward through the sefirot, subtly dividing into positive and negative poles. Said another way, the primal divine light breaks apart, its sparks becoming separated from their source, imprisoned in the material creation. ‘This is the realm of duality. The symbolism of the sefirot was extended by each generation of mystics to interpretations of the narratives and personalities of the Hebrew Bible, each being identified with a particular sefirah. 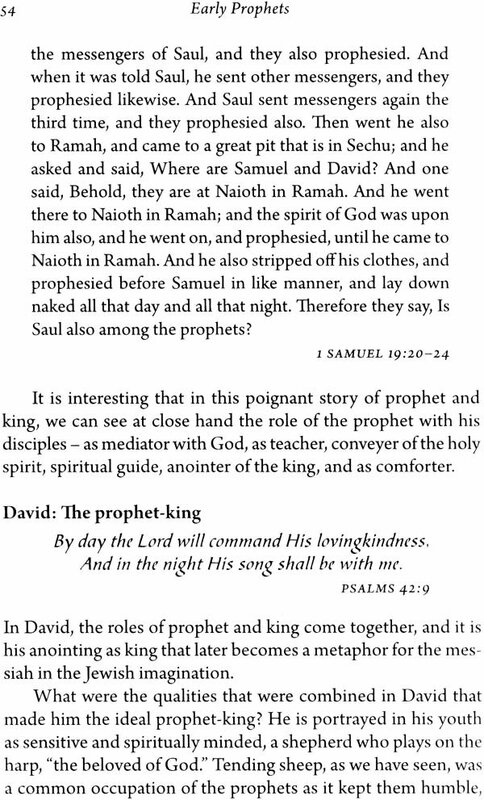 Thus the biblical stories were understood not simply as tales of human beings interacting with one another and with God, but also as metaphors for the relationship between the qualities of the divine and God himself, and as an allegory of the events of Jewish history. With the contribution of numerous mystics following the spiritual path over hundreds of years, the symbolism of the Kabbalah has evolved into an elaborate interlinking set of symbols and metaphors with layer upon layer of meaning. Symbolism became the means of conveying several levels of reality at once. Each symbol is like a hypertext link to a multi-faceted reality concealed within a simple word or phrase.